English players may be the "masters" of diving, said Arsenal boss Arsene Wenger. 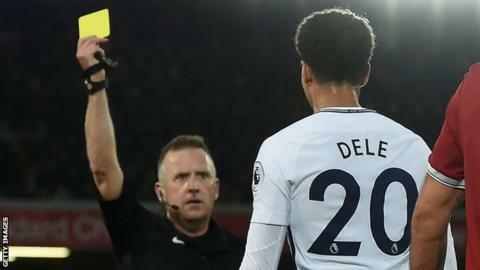 Tottenham's Dele Alli was booked for simulation in Sunday's draw at Liverpool. Team-mate Harry Kane was accused of diving by Reds defender Virgil van Dijk in winning a penalty. "I remember there were tremendous cases here when foreign players did it," Wenger said. "But English players have learned very quickly and might be the masters now." The Frenchman said in November that Raheem Sterling "dives well" following Arsenal's 3-1 defeat at Manchester City. Wenger, whose side face Spurs in the Premier League at Wembley on Saturday, said: "I don't tell my players to dive at all. We have to get diving out of the game. "Sometimes players play a little bit with the rules. How far can you go? That is down to the referees." On Thursday, Tottenham boss Mauricio Pochettino said diving was not connected to a player's nationality. When asked if he agreed with Wenger the 45-year-old laughed and said: "Argentinean, Brazilian, French, it's the sense of football. "Let's not be focused on one country. I love the diversity. You can find it in England or Spain a different type of player." Pochettino also referenced the penalty awarded against him for upending England's Michael Owen during a 2002 World Cup match, when replays later suggested he had not touched the striker. "I am honest always," he said. "In 2002 my vision about English football. I didn't touch Michael Owen and he dived. "Today we are so sensitive. I like to treat the sense of football. Football for me is being creative. To try to not cheat but trick the opponent in a good way." This season the Football Association introduced new regulations to retrospectively ban players who dive. A panel is tasked with looking for cases of simulation by reviewing footage every Monday, and any player found guilty is suspended. In October, Carlisle United forward Shaun Miller became the first player to be banned, for two games. Everton striker Oumar Niasse was the first Premier League player to be suspended - also for two matches - in November. Niasse, 27, was charged following an incident during a 2-2 league draw at Crystal Palace. A penalty was given after he was adjudged to have been fouled Scott Dann. Leighton Baines converted the spot-kick and Niasse later scored to earn Everton a point. In 2012 former England striker Michael Owen blamed "the influence of players coming from South America, Spain and Italy" for the growth of diving in English football.